Have you seen that crazy little cartoon guy doing the rounds on Pinterest that has the caption ‘Pin all the things!’? I’ve spotted that same cartoon elsewhere with captions such as ‘Have all the fun!’ and ‘Read all the books!’. I want one that says ‘Buy all the shoes!’ and with it, I’ll head straight to Yaya Lala. 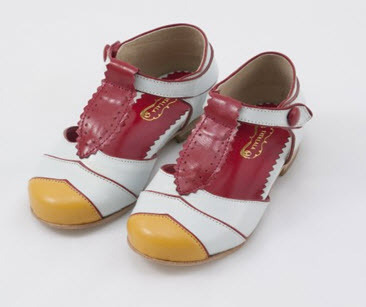 Yaya Lala is a London-based online store dedicated to a range of carefully crafted desirables, most particularly handmade children’s shoes. The original designs are created by Adriana, former architect and designer from Brazil who now lives in London with her family. It’s a small and exquisite collection and the attention to detail is superb – fine trims, contrasting leather lining, delicate perforated patterns and leather buttons. My favourite is the red and yellow Salome Girl style – they have a hint of the roaring twenties about them. At the same time, I love the pretty mint green Coroa Mary-Janes and the sweet ankle boots with the red laces…. What was I saying about buying all the shoes? Yaya Lala shoes range from £39-98 and are sized from European 21 to 32. Yaya Lala ship internationally.